Hello again, how's everyone doing? As you may have guessed by the title of today's post I visited Ikea last week and had to share some of the lovely pics I took when there. There seemed to be a couple of themes going on around the store so I have arranged my top picks into little moodboards for each theme. First is 'Pretty Pastels' always a good start to spring, this very first image was taken from the window display and looked so stunning...the perfect tea party set-up! The new bedlinen along the same theme was also so pretty with pink checks and cushions with cottage florals on the front and stripey backs. I loved the little glass mugs decorated with pastel coloured florals and the perfect tea tray to go with them covered in teacups! Now I bet you're asking what did I buy?! Well I was very good, only 2 small serving bowls and 1 large matching bowl...but they have a purpose! 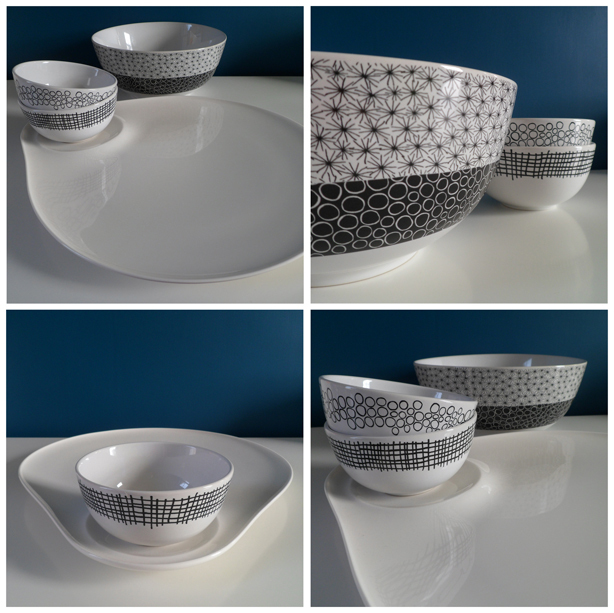 The small bowls were to go with this lovely plate I had recently bought at Villeroy and Boch in the bargain 75% off section. It's a large platter that is meant to have a bowl for dip on the side, it had no matching bowl but at £6 for the platter I knew good old Ikea would have something that would work! So the small bowls fit perfectly and the large bowl was extra...I couldn't resist...it was too pretty! All pictures taken by littletree.